Art with my needle ~ A scarf. I fell in love with the colour of some yarn, looking longingly at it week after week in Parlour yarns. I lifted it down to enjoy it more closely… the feel of the yarn told me it was just created to keep my neck warm in the winter. It was randomly hand dyed by Lindsay from Dye Candy in Randalstown, County Antrim. The jade green really sold it to me. I have not kept the ball band, and for the life of me cannot remember the details of weight, colour and needle size. I suppose it might be because I am not necessarily a strict pattern follower. I break the rules, changing the needle size to suit my mood and stitch pattern that invades my mind at any particular time. One skein was enough to complete the scarf in ladder stitch, working crosswise. Sorry that photo looks a little blurry, not sure if my hand was shaky or my eyes are tired. Uh–oh! I spy the t-shirt that I spent a full day searching the house for last week. I have a feeling the missing pink bra might be hidden underneath it. Phew! I am not going mad after all. 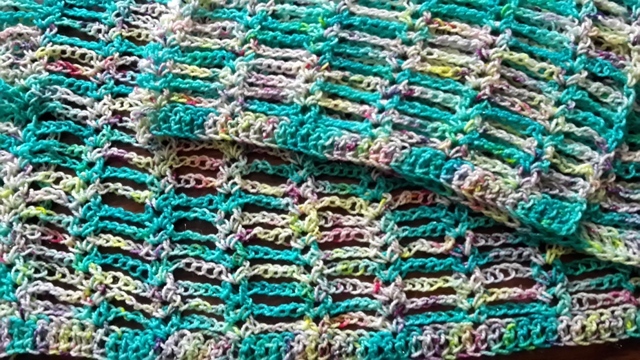 This entry was posted in Crafts and tagged Crafts, Crochet, Scarf on June 1, 2016 by Grannymar. You mean it’s not just me that does mad hunts for things that are right under my nose…? 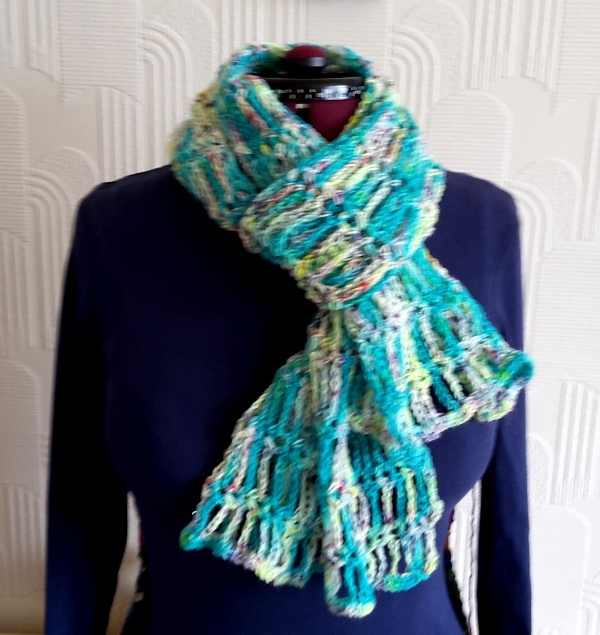 Lovely scarf; the blurring makes it look extra soft! Haha! Glad you found your missing apparel. Me too, Nancy. I can now pretend that they are new!! A lovely scarf, no doubt about it. It is cosy and warm, just what I need for my long cold skinny neck! Join the club, Granny! Losing things is what I’m best at. Viv, I am a past master at losing things these day.